The world’s poorest people also carry the heaviest burden from diseases that infect both humans and animals, according to a study published on 5 July1. The report identifies 13 such ‘zoonotic’ diseases, including tuberculosis, anthrax and hepatitis E, which together cause 2.4 billion cases of human illness and 2.2 million deaths each year, mostly in low- and middle-income nations. The greatest impacts are concentrated in just a few countries including India, Nigeria and Ethiopia, where large populations and close daily contact between people and livestock provide ripe conditions for endemic zoonotic diseases to arise and spread, the study says. In contrast, the developed world, including the northeastern United States and the United Kingdom, are hotspots of emerging zoonotic infections, such as avian influenza. “Zoonoses present a major threat to human and animal health. The burden for poor farmers is big,” says Delia Grace, a veterinary epidemiologist at the International Livestock Research Institute (ILRI) in Nairobi, and lead author of the study. The research team, which also included researchers from the Institute of Zoology in London, and the Hanoi School of Public Health in Vietnam, analysed 1,000 surveys of disease covering 10 million people and 6 million animals. Livestock provides poor families with up to half their income and 6–35% of their protein intake. 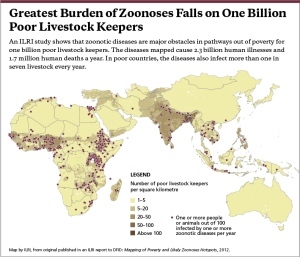 Demand for livestock products such as meat and milk is rising across the globe and could offer poor farmers a route out of poverty as markets expand, but zoonotic disease are a major obstacle to this goal. For example, the study estimates that one in eight livestock animals in poor countries are affected by brucellosis, reducing milk and meat production in cattle by 8%. In addition, 27% of livestock in developing countries showed signs of current or past infection with bacterial food-borne disease. The latest research will help direct efforts and resources to where they are most needed, so that they can have the greatest impact in tackling disease and poverty, says Grace. The study builds on previous efforts to rank zoonotic diseases affecting the poor. But those efforts relied on the opinions of experts and farmers and so were less objective than this study, she says. It also updates and adds to existing disease maps, which focused on emerging human diseases covering the years 1940–20042. The new report includes data up to 2012, finding an additional 30 disease reports both before and since 2004. It shows that the United States, the United Kingdom and Australia are the key hotspots for emerging zoonotic diseases. It is unclear why endemic diseases and emerging diseases follow different geographical patterns, says Grace, a finding that conflicts with the idea held by many scientists that the crucible of disease emergence is biodiversity hotspots, which tend to be found in developing countries. “We don’t know why this is. It could be reporting and detection bias,” she says. Patchy surveillance and under-reporting is a huge problem in developing countries, where farmers fear they will lose their livestock without receiving compensation if they report cases of disease. “Developing countries need help to develop reporting and surveillance networks and training for farmers and veterinarians in spotting and reporting incidents of disease,” says Bernard Vallat, director-general of the World Organisation for Animal Health (OIE) in Paris.